Unfortunately, we now live in a world of fried food, cheap takeaways, and sugar-laden snacks. These types of food are terrible for our health – leading to increased obesity and heart disease around the world. Against that backdrop, it’s more important than ever to make sure you keep your body in top condition. A good diet and plenty of exercise 8 Easy Exercises To Help You Stay Fit At Your Desk 8 Easy Exercises To Help You Stay Fit At Your Desk Staying fit at your desk is actually possible. Here are some exercises anyone can do. Some don't even require getting up, others take no longer than 10 minutes out of your daily routine. Read More are the two biggest ingredients for a healthy life. There are lots of devices and apps that will help you to make sure you get the right balance of nutrients Track Your Diet And Get Leaner With These Web Apps Track Your Diet And Get Leaner With These Web Apps The envy worthy fitness levels of athletes comes from years of rigorous fitness regimens and healthy diets. If you aren’t a sportsperson, you won’t be able to duplicate it to that extent, but you can... Read More in your food. 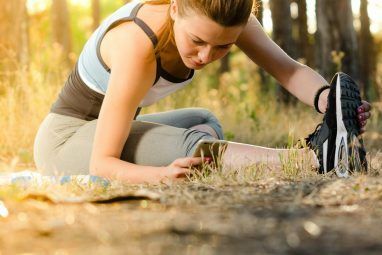 In this article, however, we’re going to focus on exercise – taking a look at some of the latest innovations in the area of fitness sensors. It should come as little surprise that the manufacturers of the sensors are so keen to add lots of new technology to their products – the race to be the market leader is well underway. The latest report from ABI Research suggests there will be more than 80 million fitness sensors in circulation by the start of 2016, with the market continuing to grow at a rate of 46 percent per year – at least until the turn of the decade. The much-maligned Apple Watch Apple Watch Sales Might Have Dropped, But It’s Far From a Flop Apple Watch Sales Might Have Dropped, But It’s Far From a Flop We won't know the true number of sales until Apple releases official data in the Fall, but even if recent poor sales figures are correct; the Apple Watch is far from a flop. Read More could yet have a purpose other than duplicating your smartphone on a smaller scale. An Apple news site from the Czech Republic has claimed that the Cupertino-based firm is creating special wristbands that will be able to connect to the gadget’s hidden port. 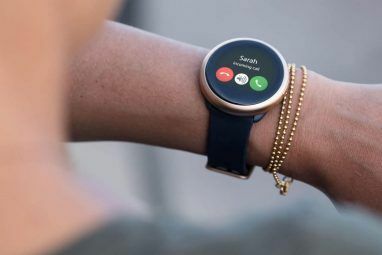 Their purpose would be to add increased health and fitness functionality to the device without forcing people to splash out on a whole new watch. If the rumors are to be believed, the new strap will add the ability to measure blood oxygen levels, respiratory rates, blood pressure, and body temperature. This is a boon for fitness-conscious owners – the Apple Watch is already considered to be one of the best fitness bands around thanks to its activity tracker, heart-rate monitor (that’ll tell you when you’re at the optimum fat-burning / cardio rate), calorie counter, and sleep monitor. 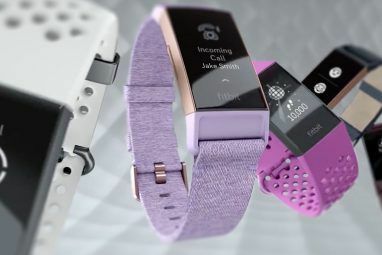 The Fitbit Surge is the company’s new top of the range fitness tracker, and as a result it’s heavily geared towards fitness junkies. All of its features and outputs are designed to give you a complete range of tools for maximizing your training regime. For example, it has a continuous heart-rate sensor that monitors your beats per minute and which allows you to set up different heart “zones” for when you’re exercising or resting. It also has an activity tracker (including a built-in GPS tracker that will let you track your pace and elevation during workouts), and an automatic sleep detecting sensor. When connected to the cloud, it can sync with multiple other devices, while the smartphone app and web app lets you set daily fitness goals, track your progress over a week, and enter your food consumption to monitor your diet plan. Finally, all your uploaded data can be classified and tagged with a workout, thus making it easy to chart and track your progress. It’s one of the best all around fitness monitors on the market The 8 Best Fitness Gadgets to Help You Get in Shape The 8 Best Fitness Gadgets to Help You Get in Shape With the increasing onset of wearable tech, the Internet of things and smart gadgets, it is now easier than ever to get in shape. Read More today. Although it can be tempting to push yourself hard when you’re on a fitness binge, it could do you more harm than good. There is only so much your heart can take, and putting too much strain on it today could cause you serious problems in later life. Therefore, it’s important to monitor all aspects of your heart’s performance while you’re doing your workout. One solution is the Scanadu Scout. It recently smashed through its funding goal on Indiegogo (acquiring $1.6 million of capital after a request for $100,000), and it’s expected to go on general sale later this year. It’s designed to be a medical-grade Tricorder New Biosensors Will Turn Your Smartphone Into A Tricorder New Biosensors Will Turn Your Smartphone Into A Tricorder When it comes to health, new smartphone sensors have the potential to turn you phone into a medical tricorder right out of Star Trek. But what will you do with them? Read More and will therefore track your temperature, heart-rate, pulse oximetry, ECG wave, heart-rate variability, and pulse wave transmit time. Just place the device on your forehead for ten seconds and the data will be automatically sent to the accompanying smartphone app. Weightlifting is a great way to build strength, but it can be highly dangerous if you have poor technique or try to lift weights that are beyond your capabilities. The Beast Sensor claims to be the first sensor that will help you track and improve your lifting. 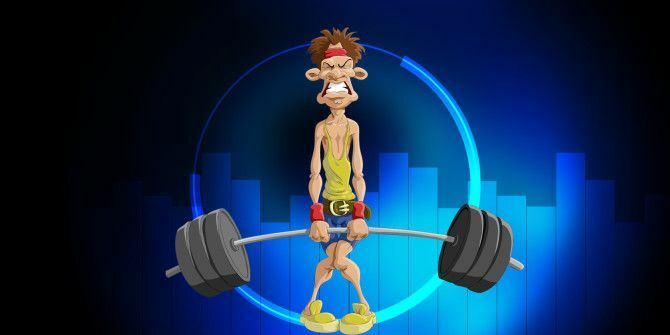 Designed by a team of engineers and strength and conditioning coaches, it will provide real-time strength metrics through a Bluetooth-connected smartphone or tablet. It works by using an embedded magnet that can be placed either on the machine itself or on your wrist. The magnet will sample motion data up to 50 times per second. It then uses this data to suggest improvements – for example, modifying your load, number of reps, number of sets, rest time, or rep speed. Finally, the gadget also has a web app that will let you plan your sessions in advance. Personal trainers can be expensive – wouldn’t it be great if you could have a virtual personal trainer How to Get Fit with the Right Personal Trainer Online How to Get Fit with the Right Personal Trainer Online Is online training effective? Will you get the same benefits? And how can you go about finding the best trainer for you? Here's some advice for finding success in your online personal training. Read More right alongside you, giving constant feedback on your training? Now you can thanks to Moov Now. The small device analyses and coaches your technique, counts your reps, “talks” to you as you exercise, supports third party heart-rate monitors, and includes a social element that allows you to connect and compete with friends. Most interestingly, it is sensitive to five different sports – running, walking, cycling, swimming, and boxing. It means you can quickly understand where your strengths and weaknesses lie and adjust your exercise accordingly. Do you own any of the devices we’ve discussed? Perhaps you have other ways of monitoring your fitness goals? Are these gadgets even able to help you improve your workout? Explore more about: Fitness, Sports Apps, Wearable Technology. No installation, no registration. One step and you have remote access.